At this time of the year a lot of people’s thoughts turn to how, and where, to keep cool. So this week I thought I would offer some ideas along those lines. Personally, as someone who can feel the cold even in the midst of a heat wave, I’m not one for cold water, it has to be like a jacuzzi for me to get in it. However for many people, locals and tourists alike, going for a swim or a quick dip in a pool, lake or river is the perfect way to cool down and seek respite from the heat. 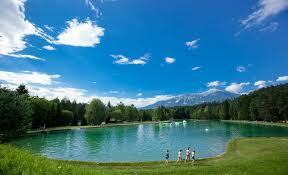 RADOVLJICA SWIMMING POOL – The Olympic-size swimming pool in Radovljica is open all year round. During the winter it is covered over but during the summer it is open-air. It also has a pool for kids, beach volleyball, a pizzeria and there’s a campsite right next door. KROPA SWIMMING POOL – A 25mx12.5m pool with a separate pool for kids, beach volleyball, a café and a picnic area. 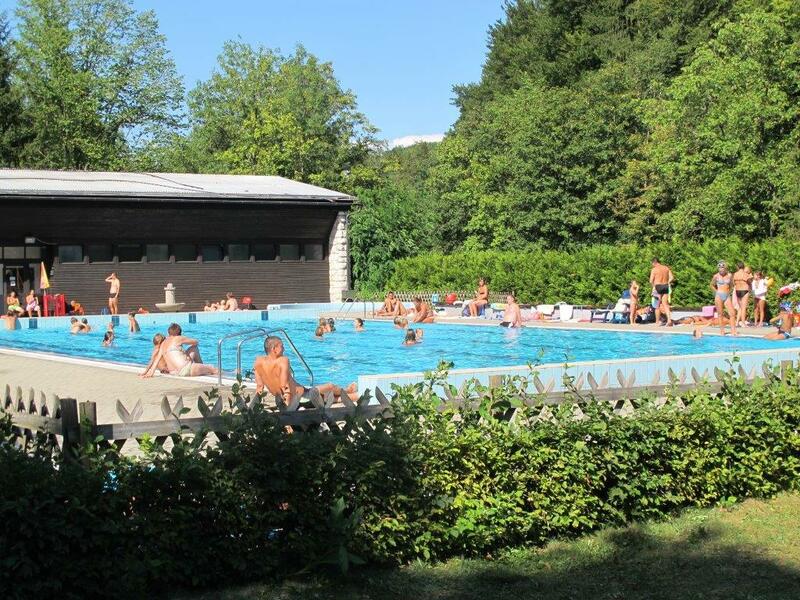 The pool is located in the Lipnica Valley at the junction towards Kropa and is open daily during the summer. 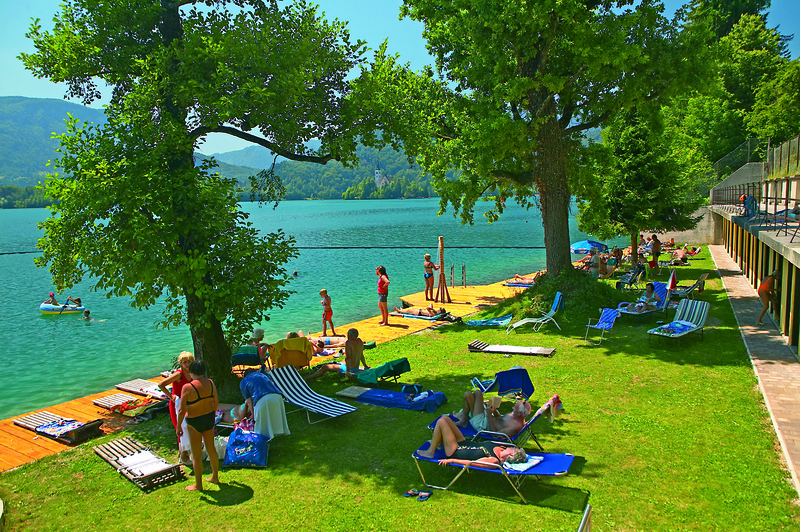 CAMPING ŠOBEC – Take a dip in the Šobec lake at the campsite of the same name. It is also open (admission charge payable) to those not staying at the camp. BLED CASTLE LIDO – The only designated bathing and swimming area by Lake Bled. It is set right beneath Bled Castle and has ample facilities including changing rooms, lockers, toilets and showers, rental of beach umbrellas and rowing boats, snacks and drinks stands. BLED LAKE – You can also take a dip directly into the lake. Due to the changeable weather this year, the temperature of the water is a little lower than usual and is currently around 22 degrees. For those brave enough, the Sava river is also an option, be it for cooling off, water sports such as rafting, or, as I did last weekend, just sitting relaxing on its banks. Yes, I do relax sometimes – though I had been for a 4 hour bike ride first!! Of course there are also many other ways of keeping cool in the heat. My preference is to go for a walk in the cool of the forest or high in the mountains and since Slovenia is largely covered by forest and here in Gorenjska there are mountains a plenty, these things are not difficult to find! And not forgetting ice-cream – an essential summer ingredient which you certainly don’t have to go far to find. There are numerous cafes offering homemade ice-cream. One of my personal favourites in Radovljica is Vidic House (Vidičeva hisa) in the old town centre of Radovljica where there are a wide variety of flavours and generous portions to match, whilst in Bled I usually head for the famous Šmon Pattiserie which, in addition to ice-cream, offers an impressive (and irrestistible!) range of cakes and pastries.